STsn had asked me, how often do i update my blog, frankly, i never observed. I update whenever i feel like it or whenever i have something to show. I'm such a lazy bum. lolz. I guessed i needs alot of motivation to update my blog daily. Obviously, i can't make a living out of it. And that's probably the reason why i don't have any advertisement bar in my blog. Well, i should say, even if i do, not many visit my blog and i would probably died before i could even see the cheque reaching me. Lolz. Anyway, if one day, should i decide to put up the advertisement bar, please don't forget to click whenever you visit. And btw, if you do visit any other blog with advertisement bar, please CLICK CLICK CLICK as many time as possible. It's a good deed. lolz. Make this last week. 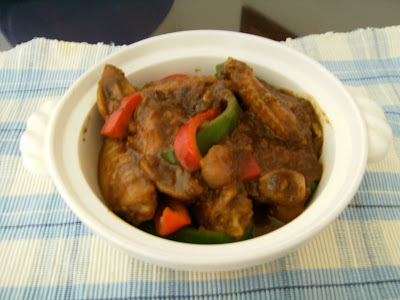 Ayam pongteh - a nonya dish. Although the picture don't look appetizing, but i could assure you that this dish is pretty tasty. 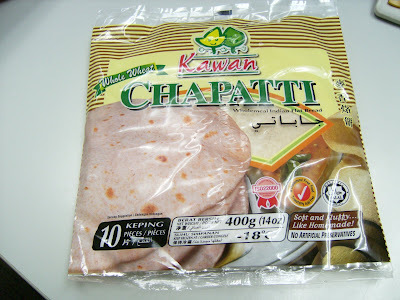 And i have been crazy over this indian bread call CHAPATTI. OO........ yummy. This is my winning from an instant lucky dip when i bought some health supplement from GNC. 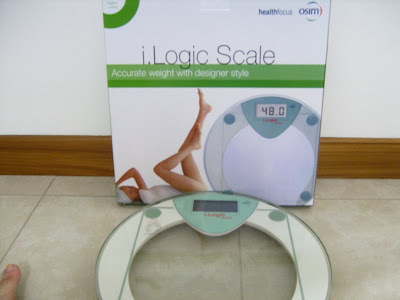 Yes, yes this item is from OSIM. I don't know how is GNC related to OSIM. But i was given this coupon to the instant dip in OSIM. According to the sales representative, this weigher cost $99. Not a bad win afterall. 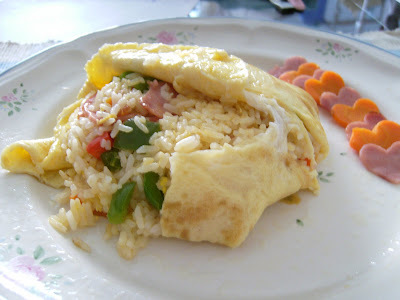 I make this this morning for brunch. Heehee..... yes, brunch because we are heading somewhere else in the early afternoon. Do you like this view? Haha.... i like them all. Therefore a collage is done. 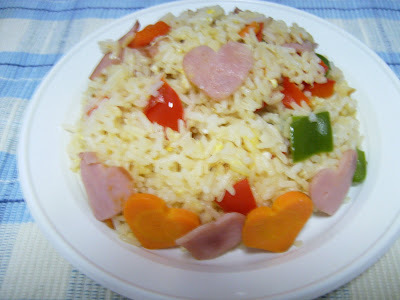 As i never like frozen peas, i have replaced the frozen peas normally use in fried rice with red and green pepper and carrots which is a healthier choice. 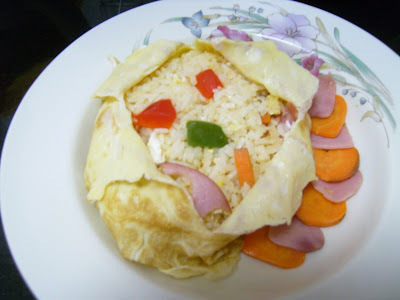 Pour well beaten egg into pan, twist and turn pan so that egg is spread thinly and evenly round pan. Overturn onto a plate, slit open the crepe and serve. 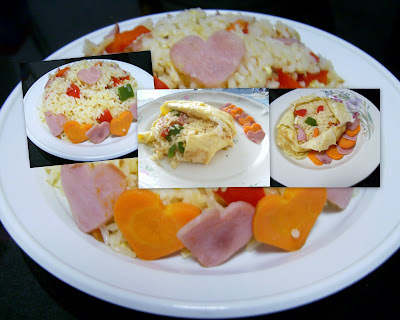 Wah, u're also using heart-shapes in your recipes now.... Good try & looks nice!